A quick flight from Lima to Cusco and a little taste of altitude sickness to get us in the mood for Machu Picchu. 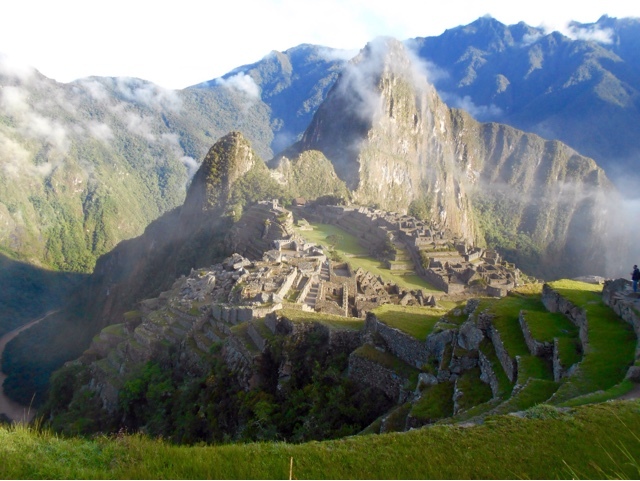 We had always planned on visiting Machu Picchu from the early days of our Latin America tour. 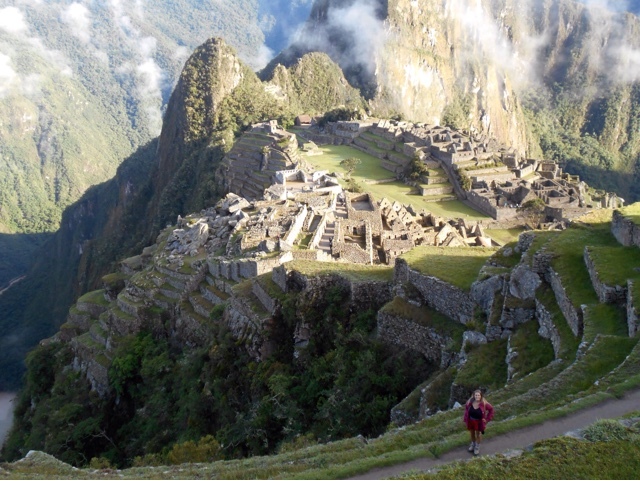 Visiting Machu Picchu for us was a pinnacle moment in our travels it marked the end of a six month journey which would lead us from the shores of the Caribbean to the incredible Inca heritage site and the one and only Machu Picchu, one of the great wonders of the world. 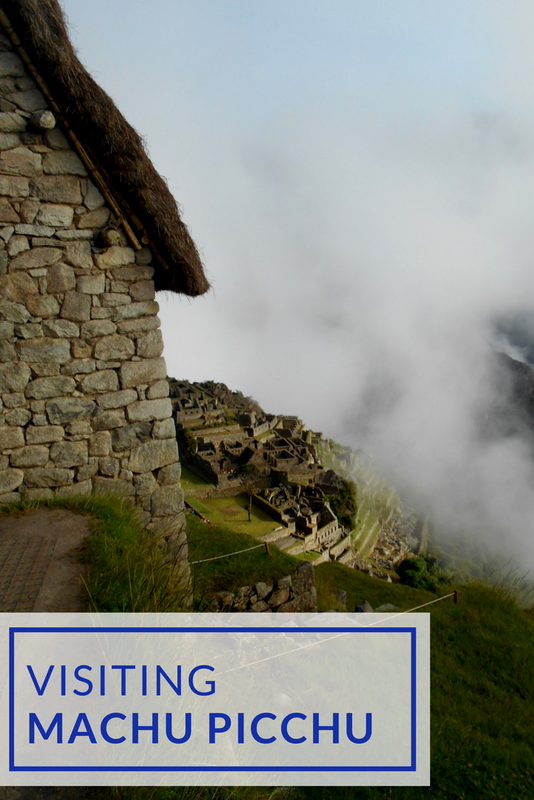 Regarded as a must see by almost any travel article ever written, here’s my guide to visiting Machu Picchu on a budget. 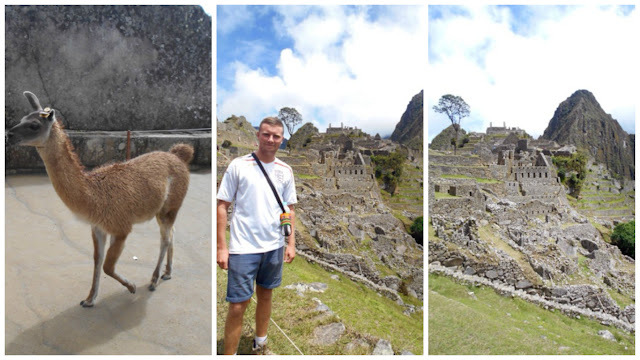 Let me explain the journey to Machu Picchu briefly. From Cusco you take a 10 Sol collectivo to Ollantaytambo, a picturesque Inca town in a valley surrounded by Inca settlements to the east and to the west. The whole town is an old Inca settlement and still using the ancient water irrigation systems. 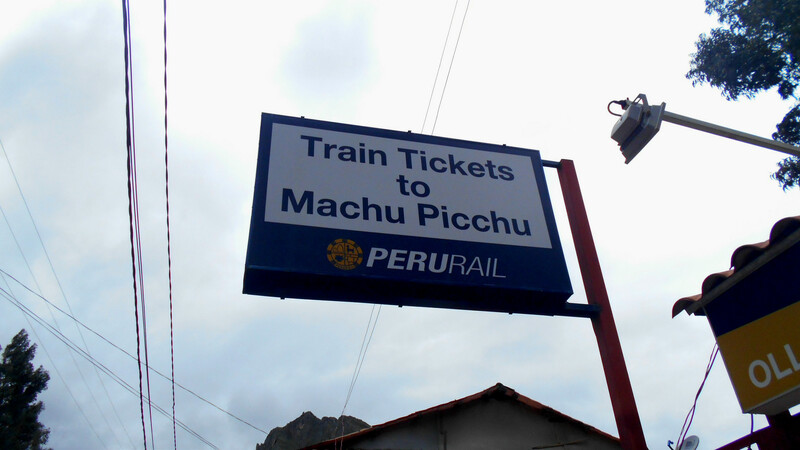 Before you get here it’s essential you already have your train ticket and your Machu Picchu ticket. Only 2,500 tickets are issued per day so do it in advanced or prepare for disappointment. Passports are essential they are checked at every possible moment, it gets rather tedious if I’m honest. Once aboard the Peru Rail train takes you winding along the Urubamba river heading towards Aguas Calientes aka. Machu Picchu Pueblo (that means village to you and me). The ancient Quechua name literally means sacred river. That’s a sacred river for a sacred valley! If you want to read a little more on getting to Machu Picchu from Cusco to and everything else you can do in between check out Where Am I To? Be prepared for Aguas Calientes, that’s the most important advice I can give. 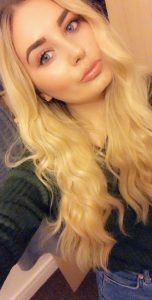 Once you’re here you are nothing more and nothing less than another tourist with a big fat wallet. Or at least that’s how everyone will treat you. Service charges ranging from 10-25% will be added to all bills in all restaurants. Negotiate a service charge before entering a restaurant to avoid later surprise. Every inch of Aguas Calientes exists because of the tourist presence here. The desire to see Machu Picchu has given birth to this unrealistic tourist exploiting economy that is nothing like the rest of Peru. Every market stall, every Mexican restaurant, every customised Machu Picchu water bottle holder, everything From the second you arrive in Aguas Calientes it swallows you up and it isn’t until the moment you leave that you are spat back out. Unless you’re prepared to haggle to the death expect to pay over the odds. This is not Peru, it is a mirage! Do not forget this. Fortunately most people only ever spend a few hours here or a night at the maximum which was true in our case. 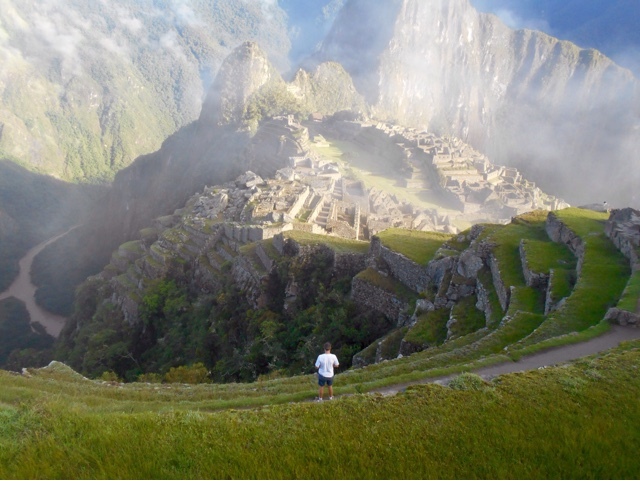 We felt it was best to arrive in the afternoon and spend the night to optimise time spent at Machu Picchu. A 5.10am alarm would wake us for our organised 5.30am breakfast, then a bus would take us up the steep slope to Machu Picchu. We aimed to be on a bus before 6.00am to beat the late risers. Without any great rush by 5.50am we were sat on shuttle number 17 and charging up the hill towards the Inca Holy Grail after yet another passport check. The shuttle was filled equally. Equal parts excitement and the rest sleeping families and people who had clearly been forced to be there. I’d recommend that if you aren’t comfortable getting up for 6.00am you don’t, and someone who is can take your space. Upon reaching the entrance and having our passports checked once more, we were able to bypass several bus loads of people waiting outside the toilets and generally just hanging around by the entrance. On the way up to the classic Machu Picchu tourist view point we were able to pass another few bus loads waiting on lower ground for the clouds to clear and sun to rise over the mountain. A fatal mistake by them. By the time we’d reached the top we were 3 in 50-so people waiting for the clouds to clear to get the perfect anorak free shot. A fine lesson in how to beat the masses if you ask me! I guess every person feels the same once they’ve entered the site. Modern day Hiram Bingham’s stumbling upon a less overgrown version of this Inca Wonder. The setting is startling, the steep geology puts into perspective just how secluded this area is and the Rio Urubamba can be seen as nothing more than a trickle below. Without sounding all doom and gloom Machu Picchu was always going to be the penultimate experience on this trip. Reaching this point is a definite milestone in our adventure and honestly I’d imagined this moment over and over. Finally seeing Machu Picchu, standing there looking over this mystical Inca community and thinking (privately) the Spanish didn’t make it here but I did! The three of us stood there in silence and in awe. Looking down at the rows of terraces and open communal areas Aguas Calientes didn’t even enter my thoughts, it had become a bump in the road to this spectacular sight. Machu Picchu isn’t the oldest set of ruins I’ve visited, nor is it the biggest but Jesus it’s the most breathtaking (especially without all the anoraks). You can leave and re-enter the site twice, so once the masses began to appear we left to get a guide to make the most of our time. 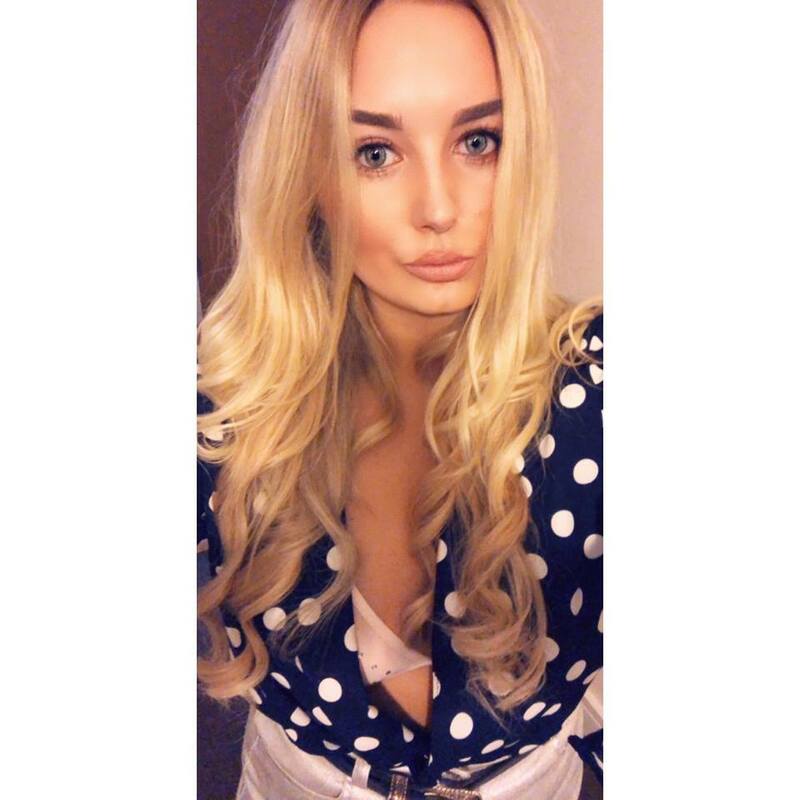 I’m not usually one for guides but in this case I would fully recommend. Many of the names given to buildings on Machu Picchu are of European or North American origin and relate in no way to their Inca meaning. The presence of 3 throughout Machu Picchu represent the Inca belief in the 3 worlds. The presence of 2 represent the sun and moon, the summer and winter and male and female. 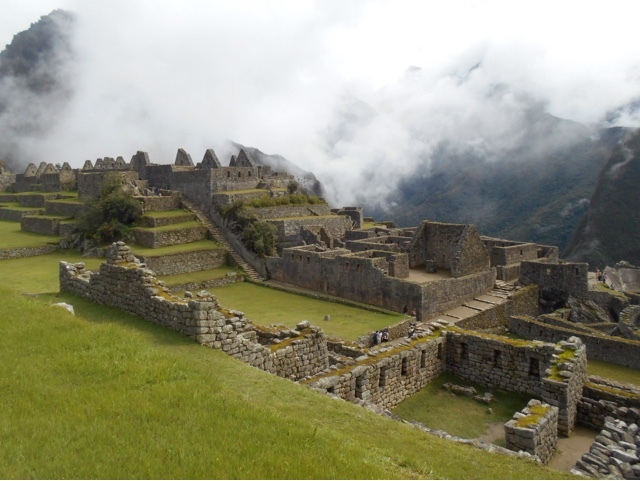 A greater understanding of the Inca people makes for a better experience and appreciation. A final point I will make about Machu Picchu is one that is extremely important to me. Not just as someone who loves tourism but as a person who cares about history. Machu Picchu remains how it is because of the rules that are in place. Peruvian authority and UNESCO rules exist for a reason. If you are told not to sit on the 500 year old walls please understand that there is a valid reason for this. 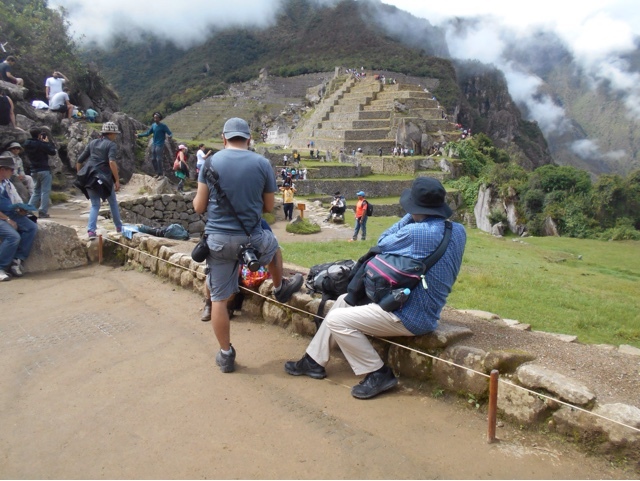 This is nothing personal but Machu Picchu just happens to be more important than your need to rest your legs. No smoking, I’m sure, means no smoking and no eating means no eating. Respect the preservation efforts so generations to come can still enjoy this wonder. Don’t step over the ropes, don’t walk on the grass or walls and don’t stuff your bags into window holes. Your personal needs are irrelevant. I cannot express enough how much seeing each of these things irritated me. Respect the importance of this site and be prepared to sacrifice a sandwich for the greater good..